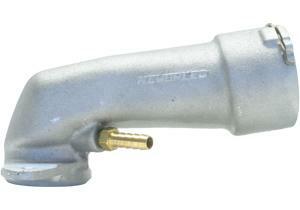 Designed as a direct replacement for your factory steel pipe that leads air into the turbocharger. NEUSPEED’s high flow design flows almost 63% more air than the factory inlet pipe. When combined with a free-flow exhaust system, the NEUSPEED inlet pipe can add up to 5hp to your engine. NEUSPEED’s inlet pipe is an O.E. quality aluminum casting that retains all the stock mounting provisions — not a crude cut-an-weld piece like some of our competitors. On a flow bench, the restrictive factory inlet pipe flows 215cfm at 39”of water. The NEUSPEED tiptronic turbo inlet pipe flows 350.4cfm at 39”of water. Designed specifically for 5-speed Tiptronic equipped applications, but will also fit all manual transmissions. This item is not currently approved by CARB for use on pollution controlled vehicles in the State of California. Check your State’s vehicle emission laws before installing. NOTE: Use part number 48.10.88, 48.02.44, & 48.02.45 for OEM Turbos. Use part number 48.10.86 if you have a K04 or SuperK04 turbo.